What Is love? Great minds have been grappling with this question throughout the ages, and in the modern era, they have come up with many different answers. According to Western philosopher Pat Benatar, love is a battlefield. Her paisan Frank Sinatra would add the corollary that love is a tender trap. Love hurts. Love stinks. Love bites, love bleeds, love is the drug. The troubadours of our times agree: They want to know what love is, and they want you to show them. But the answer is simple: Love is a mix tape. In the 1990s, when “alternative” was suddenly mainstream, bands like Pearl Jam and Pavement, Nirvana and R.E.M.—bands that a year before would have been too weird for MTV- were MTV. It was the decade of Kurt Cobain and Shania Twain and Taylor Dayne, a time that ended all too soon. The boundaries of American culture were exploding, and music was leading the way. It was also when a shy music geek named Rob Sheffield met a hell-raising Appalachian punk-rock girl named Renée, who was way too cool for him but fell in love with him anyway. He was tall. She was short. He was shy. She was a social butterfly. She was the only one who laughed at his jokes when they were so bad, and they were always bad. They had nothing in common except that they both loved music. Music brought them together and kept them together. And it was music that would help Rob through a sudden, unfathomable loss. In Love Is a Mix Tape, Rob, now a writer for Rolling Stone, uses the songs on fifteen mix tapes to tell the story of his brief time with Renée. From Elvis to Missy Elliott, the Rolling Stones to Yo La Tengo, the songs on these tapes make up the soundtrack to their lives. 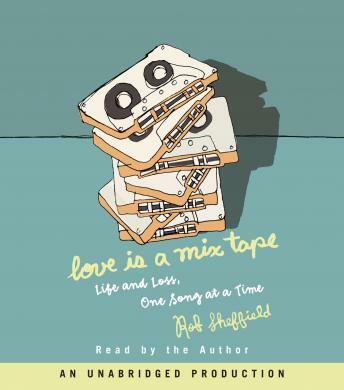 Rob Sheffield isn’t a musician, he’s a writer, and Love Is a Mix Tape isn’t a love song- but it might as well be. This is Rob’s tribute to music, to the decade that shaped him, but most of all to one unforgettable woman.